2017 BUICK LACROSSE, Car News! 2017 BUICK LACROSSE, Like the Buick cars of yesteryear and their plush rides? Think Lexus has gotten too pricey? Buick would like to introduce to you the 2017 LaCrosse. The new full-sizer is lighter by 300 pounds, longer, lower, and wider than the previous generation. Those are all good things but it has also achieved a new level of quiet, something Buick hopes will appeal to customers in this segment… you know who you are. The new design looks as if the previous car took a picture of a Chevy Impala to a plastic surgeon and said, “I wanna look like that.” The surgeon did a good job. Power comes from a 3.6L V6 (305 hp, 268 lb-ft) with auto start/stop mated to an 8-speed automatic. The combination is capable of producing 21/31 mpg city/highway in front-wheel drive models, according to the EPA. All-wheel drive cars lose one mpg in the city and two on the highway. Standard on all LaCrosse models are high-intensity discharge headlamps, LED taillamps, 18-inch wheels (20s are available), and a capless fuel filler. A MacPherson-strut suspension is also standard but the company’s HiPer Strut suspension setup is used on FWD models fitted with 20-inch wheels. Four trim levels are available with base prices ranging from $32,990 to $44,190 for models in top-of-the-line Premium trim level with AWD. Several option packages can be had – depending on trim level – including the Sun and Shade Package ($1,550 – panoramic moonroof and power rear sunshade), the Sights and Sounds Package ($1,145 – navigation and Bose premium audio), Driver Confidence I ($445 – blind spot monitoring, rear cross traffic alert, and lane departure warning), and Driver Confidence II ($1,690 – adaptive cruise control, automatic parking assist, and automatic emergency braking). 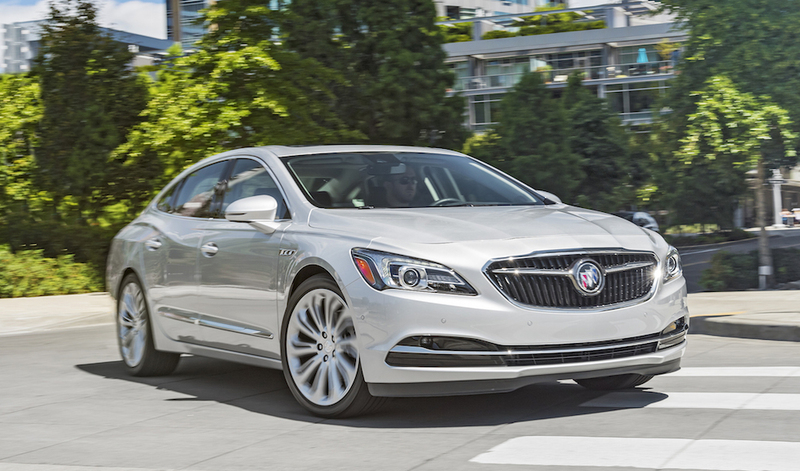 According to a press release from Buick, the new LaCrosse went on sale early summer 2016. It’s now August so I did an inventory search of three Buick dealerships in the Denver area but couldn’t find any. I did, however, come up with two 2016 models and four (!) 2015 models still on the lot. Did somebody say “incentives”? Check out the redesigned 2017 LaCrosse in the video above to get all of the details on America’s new luxury cruiser.